The US sockpuppet regime in Iraq has launched an attack on the city of Kirkuk. Kurdistan Regional Government’s independence referendum last month. Multiple reports indicate Iraqi and Kurdish officials say that armored forces were moving on the south of the oil-rich city and that some clashes have occurred between Iraqi forces and the pesh merga, who maintain Kurdish defensive lines around Kirkuk and the oil fields. Hemin Hawrami, a spokesman for the president of the Kurdish region, Massoud Barzani, wrote on Twitter that pesh merga soldiers had destroyed four government Humvees and had twice repelled a government attack in a district south of Kirkuk. 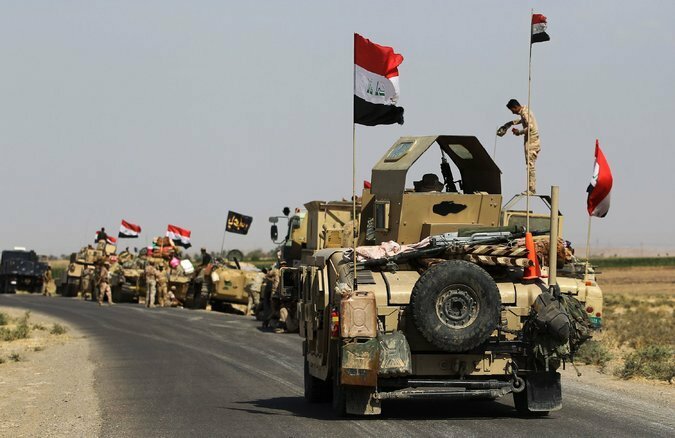 The New York Times reports that the Iraqi Army and the pesh merga have been trained and equipped by the United States as part of the American-led coalition battling Islamic State militants in the country. But the other major players in the conflict — the Shiite militias that make up a considerable amount of Iraq’s fighting strength — have largely been trained and supported by Iran. Publicly, anyway, the Pentagon urged “all actors” in the region to focus on battling Islamic State militants and to avoid provoking disputes among Iraqis, Reuters reports. But, according to NYT, the independence vote, in a referendum held Sept. 25, strained relations not only between Kurdish authorities and Baghdad, but between the Kurds and the United States. The United States government had adamantly opposed the referendum, saying it would undermine the fight against Islamic State militants, foment ethnic divisions and create instability in Iraq. Kirkuk produces close to 400,000 barrels a day, which makes up almost 10 per cent of total Iraqi production. Therefore, the Iraqi central government risks losing its position as the second-largest producer in Opec to Iran were Kurdistan to declare independence. Oil prices jumped more than 1 per cent in early Asian trading, with Brent crude oil hitting $57.76 a barrel. Do you have a feeling either way that this secession is pro or anti liberty? The Kurds seem to do a lot more female genital mutilation than the rest of Iraq. Does that count?